The special feature of Aluma-Hyde II (and the reason for its development) is its increased resistance to bore cleaners, solvents and other cleaning chemicals, even trichloroethylene. Today’s family of fast, aggressive bore cleaners really do a terrific job getting dirty gun bores sparkling clean, but they can wreak particular havoc with any other finish they contact. After full cure, Aluma-Hyde II proved solvent-proof to all but the most aggressive, copper-removing bore solvents. Aluma-Hyde II is formulated with a hard-curing epoxy base that contains additional, high-density pigment for a durable finish that sticks to all properly prepared aluminum and alloy surfaces, steel and plastics - it’s great on synthetic stocks. Aluma-Hyde II is available in a variety of colors to help the gunsmith match the vast number of applications found in the average gunshop. Matte finishes are available in Parkerizing Gray (medium gray), Dark Parkerizing Gray (medium dark), Stainless Steel Gray (light), Earth Brown, Matte Clear, O.D. Green for creating camo pattern stocks, Desert Tan (light, desert-tan sand), Coyote (light, gray-brown) and the original favorite, Matte Black. Also available is Semi-Gloss Black which can be used to compliment the matte finishes or give you a black finish that is less matte if you desire. We like the Matte Black color for refinishing those used AR-15 buttstocks and handguards you pick up when building a parts gun, knock-around “truck” guns and, of course, anodized parts. Aluma-Hyde II dries to the touch in only minutes and reaches full cure in about a week. Here’s the way we apply it: Warm the part and the Aluma-Hyde II to about 90? F.; spend a couple of minutes shaking the daylights out of the Aluma-Hyde II and apply a medium coat for good coverage. You can recoat in a few minutes but don’t wait more than thirty minutes. Once Aluma-Hyde II starts curing, you must wait until it’s fully cured to recoat. You can cut the cure time to approximately two days by circulating warm air (90? F. works fine) past the part. 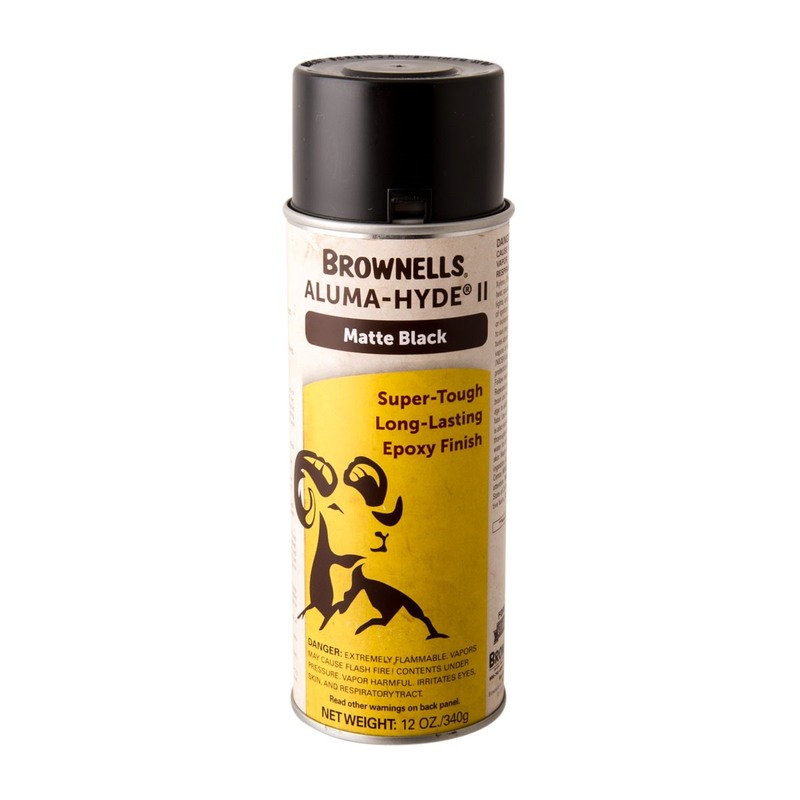 Absolutely no primer coat is required for a tough, durable, abrasion-resistant, rustproof finish that blends beautifully and compliments all gun finishing applications. Brownells Guntechs recommend use of 084-179-004 All Purpose Clean Out Nozzle prior to attempting to spray this product. SPECS: 12 oz. 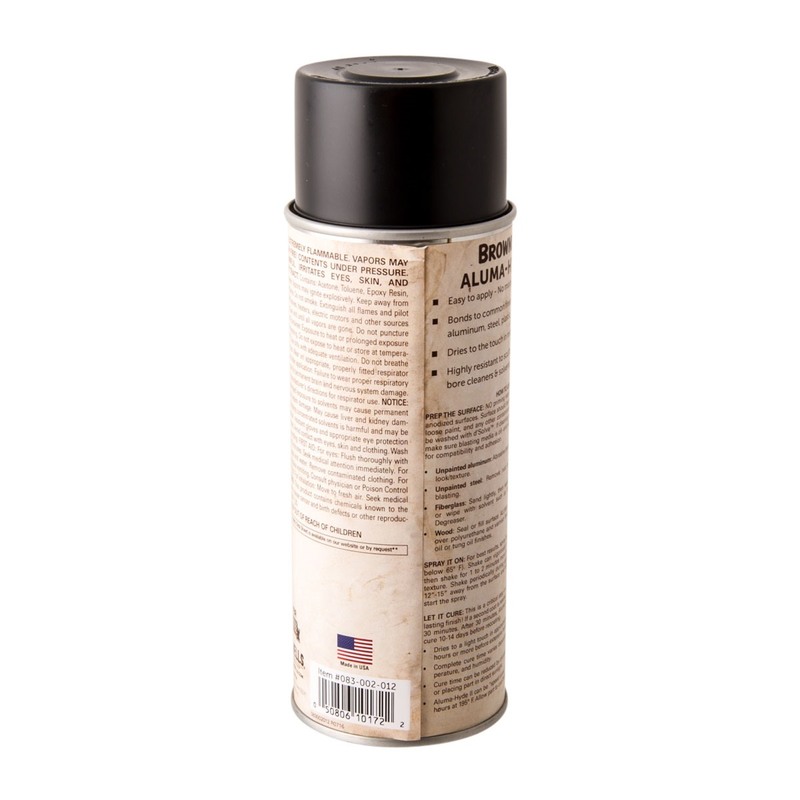 (340 g) aerosol can.